The search for better treatment of mesothelioma cancer continues moving more aggressively toward immunotherapy at the molecular level, where new drugs show promise in early testing. The latest results are about RITA, a drug that affects the important p53 protein. Scientists at the Sbarro Health Research Organization (SHRO) in Philadelphia recently uncovered drugs designed to reactivate the p53 protein, which normally serves as a tumor suppressor in humans but gets turned off by most cancers. Reactivating the protein enables a body’s own immune system to cause apoptosis, a programmed cell death within the tumor, without affecting the healthy cells around it. The findings were published recently in the scientific journal Cell Cycle and centered on RITA. 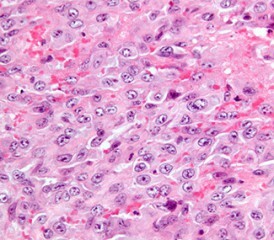 The drug performed well in cases involving epithelioid and biphasic mesothelioma cell types but was not as promising with sarcomatoid, the most aggressive form of the disease. Researchers were encouraged by RITA’s synergy with the chemotherapy drug cisplatin, which is a major part of today’s standard treatment for the disease. They believe the use of this immunotherapy drug could reduce the amount of cisplatin needed and help curtail some of the overpowering side effects. Mesothelioma is an aggressive cancer that is diagnosed in about 3,000 Americans annually. Caused primarily by an exposure to asbestos fibers, the disease has no cure. In a related study by SHRO and published recently by Cancer Biology and Therapy, researchers tested for the first time with mesothelioma a new drug identified as MK-1775. It is a selective inhibitor of WEE1, another protein that plays a key role in the cell division process that allows cancer to grow. Mesothelioma cancer cells with a deactivated p53 protein normally rely on WEE1 to repair and grow, even after being damaged by powerful chemotherapy drugs. By developing a WEE1 inhibitor like MK-1775, it would make drugs like cisplatin more effective in stopping the spread of mesothelioma tumors. The MK-1775 in theory would sensitize mesothelioma cells selectively to chemotherapy, forcing them to divide without being repaired, and thereby triggering the apoptosis. “Our studies are aimed at identifying promising new molecular therapies against mesothelioma that hold the potential for clinical use in the near future,” said Giordano, who also is a professor of Pathology and Oncology at the University of Siena, Italy. Giordano believes strongly that molecular therapies are the future of mesothelioma treatment advances, which are badly needed.